Since my friend brought me back some amazing ras-el-hanout from Morocco I have been looking at different ways to incorporate it into my meals. It has the most gorgeous flavour and so I started doing a bit of digging to see what else I could get it into. I came across a few recipes on the Good Food website so the below recipes is a combination of them all! Best of all it includes one of my favourites at the moment, CHICKPEAS. It also has some gorgeous apricots in which add a nice subtle sweetness to the dish. It’s so filling and really quite cheap to make as you don’t need too much meat. I served mine with some Ainsley Harriot Cous Cous and topped with yoghurt and coriander. Amazing!! 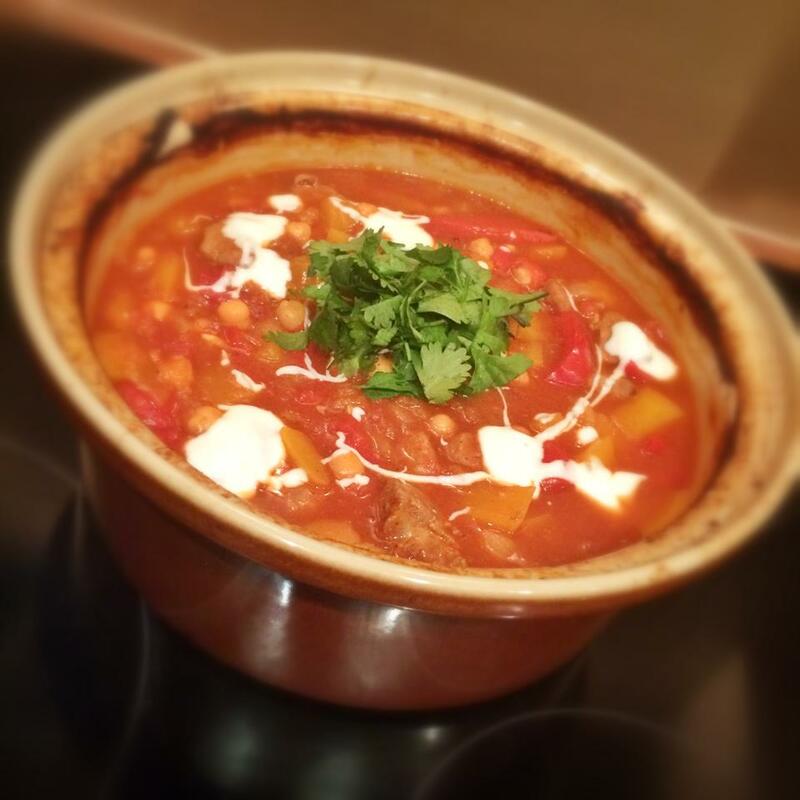 Heat 1kal in a flameproof casserole dish, add the lamb, season and brown on all sides. Scoop the lamb out the pan and pop to one side. Then in the same pan, spray again with 1kal add the onion and cook for 5 minutes until softened (add a small splash of water to stock the onions sticking). Then add the garlic, pepper and spices and cook for a few more minutes, adding a splash of water to stop the spices catching and burning. Add the lamb as well as the squash, apricots and chickpeas to the casserole, pour over the tomatoes and stock, season well and bring to the boil. Pop the lid on and transfer to the casserole dish to the oven. After 1 hour, stir the tagine and return to the oven, uncovered, for a further 30 minutes. Sprinkle over the lemon zest and coriander. Serve with couscous (I used a pack of Ainsley Harriot and added a little lemon juice) and top with a swirl of yogurt and harissa. Finish with a few sprigs of coriander. I’m guessing this could be cooked using a slow cooker. What do you think? Any ideas on how long on low? We had friends over for dinner the other evening and I went middle-eastern, cooking this and the lamb meatballs. Worked really well and everyone really enjoyed the food. I hadn’t used these spices before and I agree with you – they are really tasty. Thanks!